Create a FREE account today, and to get access to money-saving coupons for members only! For hair, scalp, face and body. Hair Type: normal, dry, stressed, chemically treated. This ultra-creamy Hair & Skin Pro-Advanced DUAL-CARE ACTION Formula is the ideal after-cleansing balancing creamsysten for hair, scalp and all over body. This "100% Free Series" is formulated Sulfate-free, Paraben-free, Phosphate-free, Salt-free, PEG-free, and Zero-animal. Its non greasy, non occlusive, lightweight proprietary HCHE formula rishly auto-emulsifies to release phyto-protective ingredients, essential lipids, hydrating nutrients, natural biopeptides, potent anti-oxidants and botanicals. TruHydrolipidic Guard® helps repair the nautral hydrolipidic protection for optimal hydration and defense against harsh conditions and stress. Helps relieve symptoms associated with skin irritation. Balanded pH. Biopeptides help stimulate the natural collagen and help repair, nomralize and protect the nutrient-deprived zones of hair and skin. TruColour Guard® anti-fading effect helps seal, preserve and prolong the pure color and radiance of color-treated hair. Also provides thermal protection from blow dryers and hot irons. 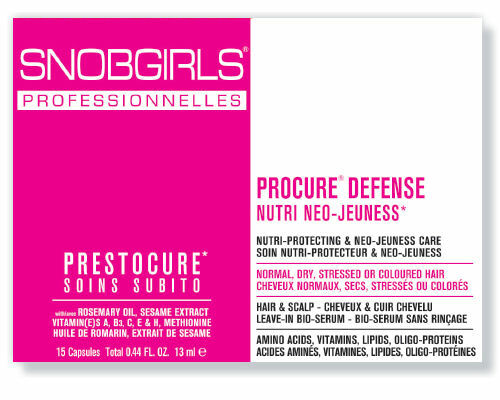 The PROCURE DEFENSE Nutri Neo-Jeuness system is enhanced with rosemary oil, sesame extract, vitamins A, B, C, E & H, methionine, and oligo-protein rich nutrients nourish and help prevent the premature loss of essential vital substances and help reverse the signs associated with hair ageing. Helps protect against the drying, oxidizing and damaging effects of sulfates, chlorine, salt, free radicals, toxins, harsh chemicals, heat styling, pollution, sunrays, technical services, coloring, perming, and relaxing treatments. This nourishing synergistic complex of potent antioxidants, photo-protecting compounds, multifunctional phyto-extracts, and replenishing nutrients helps neutralize free radicals, prevent, protect, hydrate and repair deep from the core to the surface. Helps preserve and sustain the optimal integrity of internal and surface structures of hair for silky, shiny, healthy and youthful looking results. Rich in potent natural phyto-antioxidants, it moisturizes, nourishes and conditions while protecting against premature skin aging, environmental chemicals and pollution by neutralizing free radicals. It actually helps promote the natural healing of skin. Protects, nourishes and repairs skin's natural hydrolipic barrier and restores normal skin pH for optimal natural defense against daily enironmental assaults, and helps to restore normal, healthy skin. Biopeptides + Vitamin C + Retinyl Palmitate Proprietary System helps trigger and boost production of skin's natural collagen for optimal texture, resilience, suppleness, elasticity and smoothness of your skin, while contributing to the reduction of the signs associated with premature skin aging. Hair: Apply to wet hair. Leave on 1 minute. Rinse thoroughly. Body: In the shower, smooth onto freshly cleansed and wet body. Rinse thoroughly. Use PROCURE DEFENSE Bio-Serum before styling for best results. PROCURE Prowash for hair, scalp, face and body. © 2019 Madison Avenue West Salon , All Rights Reserved.